The Kidde Key Safe Slimline key lock box is the convenient, secure way to avoid the frustration of being locked out of your house or apartment. It is also the best method to provide access to contractors or Meals on Wheels or your kids, without duplicating and tracking your keys. Since it is constructed using thick rustproof metal walls with an interlocking faceplate, this durable key storage box provides a superior level of security. 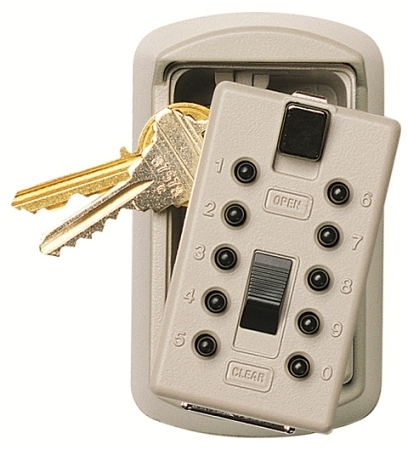 The Key Safe Slimline features a heavy duty mechanical keypad -- which needs no batteries -- and opens easily using a numeric combination you choose and set yourself. The combination of this lock box to hold keys may be changed whenever you wish for added security allowing you to give contractors, family members or caretakers access while maintaining the security of your keys. We do suggest that the combination be between 4 and 6 digits. The raised keypad design permits opening the unit even in near dark conditions unlike most dial combination types. Order now to make sure you have a spare key handy for the kids after school for repairmen, employees, tenants or simply for emergencies. The Kidde Key Safe Slimline is a wall mount style key lock box that holds two standard size keys. It installs in minutes on a wall, fence posts or other wooden surface using the included wood screws. If need be, it may also be installed on metal or masonry surfaces using your own hardware. Overall size 4"h x 2-1/4"w x 1-5/8"d.
Your choice of clay (pictured) or white. Save! When you buy 6 or more: $27.50 ea. 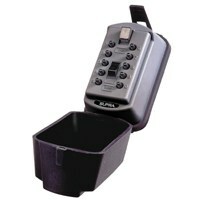 Add a protective cover: The cove keeps the faceplate and locking mechanism clean if exposed to dirt or severe weather. Flexible black rubber (shown below) fits snugly but allows easy access $6.95.